Most of us hope our acne days are behind us once we become an adult. However, for some of us, acne follows us well into our adulthood. If you are battling acne and you are tired of ongoing breakouts, it is time to look for long-term solutions. Here at our skin care clinic in Bee Cave, we provide an array of skin care services, including acne treatment. We understand how difficult it can be to struggle with acne, no matter your age. We will work with you to assess the reasons behind your acne and to work with you to find the right solution for your particular body. Not only can you visit our clinic for assistance with acne treatment, but you can also check out some of these tips that can help lessen breakouts and improve your skin’s health. The first thing you should do when facing acne breakouts is to take note of when they occur. Every single time you break out, write down notes about the incident in your planner. By tracking when breakouts occur and how severe they were, you can start to determine if there are any patterns emerging. For example, many women struggle with acne due to hormonal changes. This could be centered around when your menstrual cycle occurs or it might even be due to the particular birth control you are on. For other people, it might be related to a specific food that causes irritation to their body. Make detailed notes of when your acne is at its worst and when your skin is at its best. No matter what medication or method you utilize to combat adult acne, you will need to pair it with a good skincare routine. Your face is bombarded daily with pollutants and allergens in the air. Be sure that each evening you are gently cleansing your face from the day’s pollution. You should also utilize the right moisturizer for your needs. Be sure that the skin care products you implement into your daily routine are high quality and are the right fit for your skin type. While high-end products might carry a bigger price tag up front, they will usually go much further and will improve your skin’s health, rather than cause further irritation. What is your current diet? Do you eat a lot of healthy vegetables and fruits? While there are many myths revolving around food and acne — no, chocolate isn’t guaranteed to cause acne — there is truth to the fact that a nutritious diet supports healthy skin. Focus on eating a balanced diet that is rich in important nutrients. You can also take note of any foods that seem to give your skin trouble. Just because someone else doesn’t suffer from an acne outbreak after a dairy-laden meal doesn’t mean you won’t. Every person’s body handles food differently, which makes learning your own body’s patterns a must. Unfortunately, many of the face washes on the market that are aimed toward acne treatment are harsh and riddled with chemicals that further damage your skin. Be wary of overdoing it when it comes to cleansing your face. Taking away too much moisture can actually cause your skin to overcompensate and produce too many natural oils. Focus on gently cleansing your face. Don’t use a rough washcloth or loofah, but rather, invest in a soft cloth that will carefully rid your face of the day’s grime without harming your skin. Did you know that stress can contribute to acne? If you find that the more stressful a week you have had the more acne breakouts that occur, it is an obvious sign that you need to find more relaxation in your life. While there is no way to rid our lives of stress entirely, you can take measures to cut down on stress that isn’t necessary. For example, are you committing to too many activities each week? Learn how to say no and limit how far you are being stretched. Perhaps you need to spend one day a week that is focused solely on your mental well-being. Take the steps necessary to cut down on day-to-day stress. Finally, don’t battle acne alone. 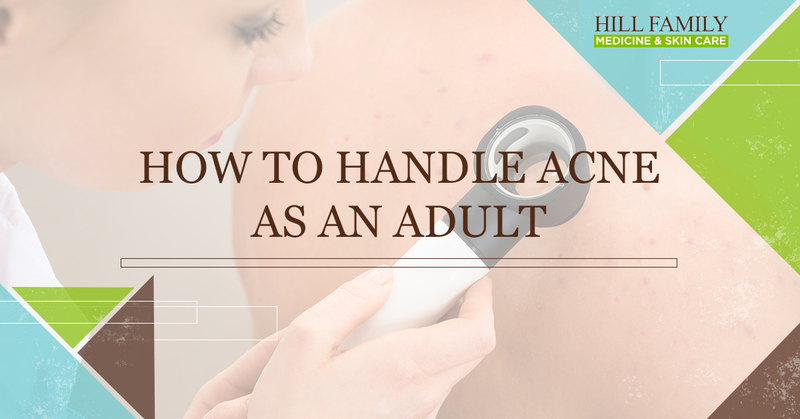 While it can be frustrating to face the fact that you are dealing with acne as an adult, your doctor can help you find the right solution for your skin. Here at our skin care clinic in Bee Cave, we offer an array of acne treatment options and we will be happy to assist you in finding what is right for your body. Book an appointment today and find your way to healthy, acne-free skin.